ILEAD USA – Ohio is a biennial program that teaches librarians to work with each other, develop their leadership skills, and use participatory and emerging technologies to solve a clear problem in their community. ILEAD USA – Ohio fosters the development of team projects over a nine-month period through a combination of three face-to-face meetings and intermittent online sessions. At the end of nine months, each team presents their project with the goal of either sustaining these projects as ongoing library programs or directly applying the knowledge gained to future collaborative projects. Class of 2017 ILEAD USA – Ohio pictured above. Are you interested in a program to encourage Ohio library staff at all levels and from all library types to meet 21st century needs with interactive participatory tools in a fun and casual environment? Do you want to be involved in a project that will develop your leadership and project management skills? Are you up to the task of problem-solving using marshmallows, cardboard boxes and other random items? Then ILEAD USA – Ohio is for you. 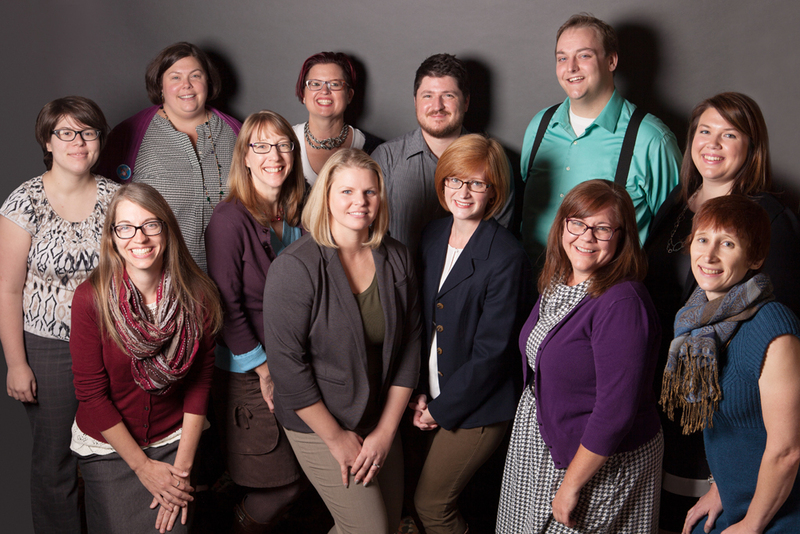 ILEAD USA – Ohio is a team-based library leadership program that teaches librarians to work with each other, develop their leadership skills, and use participatory and emerging technologies to solve a clear problem in their community. Team Members: We are looking for up to 5 teams of 4 to 5 individuals to make up the participants for the ILEAD USA – Ohio 2019 program. Teams are made up of individuals who have identified a community problem and are interested in learning how to use technology to solve that community need. Preference will be given to teams that are made up of individuals representing at least two different library types and at least three different libraries. Teams must apply as a single entity. This means that you will need all four or five of your team members and a project idea before submitting your application. If you need assistance creating a team or developing your idea, please contact Evan T. Struble at estruble@library.ohio.gov or 614-752-9178. WHEN: ILEAD USA – Ohio will be held March 19-21, June 11-13 and October 22-24 in 2019. Team members must commit to attending all three sessions of ILEAD USA – Ohio. Your commitment also involves time devoted between the three sessions to working on your project with your team. HOW: The only costs associated with ILEAD USA – Ohio are the costs of your travel to/from Mohican State Park & Lodge. The remainder of the costs of this program (lodging, meals and materials) is paid for by the State Library of Ohio and OhioNET, with federal funds from the Institute of Museum and Library Services. To use the participatory technology necessary to improve their communities. Click here to download the ILEAD USA – Ohio 2019 application. Contact Evan T. Struble (estruble@library.ohio.gov) at the State Library of Ohio with any questions regarding ILEAD USA – Ohio. Applications are due no later than January 31, 2019 at 5:00 pm. Team members will be notified of acceptance in early February 2019. The Institute of Museum and Library Services is the primary source of federal support for the nation’s 123,000 libraries and 17,500 museums. Through grant making, policy development, and research, we help communities and individuals thrive through broad public access to knowledge, cultural heritage and lifelong learning. To learn more about IMLS, please visit www.imls.gov. February 15, 2017 – The State Library of Ohio is pleased to announce the 2017 participants in ILEAD USA – Ohio. Teams, mentors, and instructors from Ohio have been selected for the year-long program. ILEAD USA is a multi-state program designed to help library staff understand and respond to user needs through the application of participatory technology tools, all while developing their own library leadership skills. Wisconsin and Pennsylvania are also participating in this national initiative. ILEAD USA – Ohio 2017 was supported in-part by the State Library of Ohio with federal funds from the Institute of Museum and Library Services. Additional support was provided by the Kent State University School of Library and Information Science. Photo credit: Participants from 2017 ILEAD USA – Ohio photo provided courtesy of Catherine Murray Photo. External links on this website do not constitute an endorsement by the State Library of Ohio. The State Library of Ohio is pleased to announce the 13 future library leaders selected to participate in ILEAD USA – Ohio 2015. Teams, mentors, and instructors from Ohio and national keynote speakers have been organized for the year-long program. ILEAD USA is a multi-state program designed to help library staff understand and respond to user needs through the application of participatory technology tools. Ohio participants will join others from Wisconsin, South Carolina, Pennsylvania, Delaware, North Dakota, New York, Maine, Illinois, and Utah in this national initiative. Sessions kick off in March and reconvene in June and October at Mohican State Park & Lodge in Perrysville, Ohio. Sessions will be held simultaneously in each of the 10 states, with plenary sessions on streaming video. In-person sessions, virtual meetings and activities will allow participants to hone their skills, experiment with participatory technology tools and continue communications with their ILEAD USA cohorts. Team participants will remain with their group throughout the program and are assigned a mentor. The role of the mentor is to keep participants motivated; offer expertise; and provide guidance and advice. Each team will work on a single group project that will address at least one identified need within their communities of users. The ILEAD USA – Ohio 2015 program is made possible by a Laura Bush 21st Century Librarian Program grant to the State Library of Illinois from the Institute of Museum and Library Services (IMLS). Additional support is provided by the State Library of Ohio and the Kent State University School of Library and Information Science. For additional information, please contact Program Manager, Evan T. Struble, State Library of Ohio at estruble@library.ohio.gov or 614-752-9178.